The Steriles Product Release team raised the ergonomic issue of ‘de-capping’ or ‘decrimping’ vials as the task, performed in most laboratory areas, causing most discomfort. 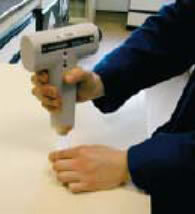 Concern mainly centred round gripping the manual tool and the force required to close it which could result in discomfort occurring in the hands, wrists and forearms. To introduce an electronic de-capper’ which eliminates the manual crimping action as the task is performed electronically at the push of a button. Initial trials, on a cross section of vials from products on site - each with a 20mm lid diameter - were successful. These were followed by successful tests in the product laboratory areas on vials with a 20mm lid plus High Performance Liquid Chromatography vials. Subsequently the electronic decapper - at a cost of £366 per unit – is now being used in the laboratory areas plus the production areas. Eliminated the likelihood of discomfort occurring as the task no longer required forceful grips to be used by the operator. The task is now completed much more quickly; therefore there has been an increase in efficiency and productivity. The financial cost is minimal.